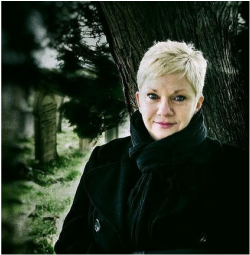 Lynn found her studies in psychology, psychoanalysis, sociology and criminal law to be most useful in substantiating her obsession with the darker side of the human psyche and much of her writing reflects this. Lynn’s interests mostly lie in occult philosophy, mythology, parapsychology, archaeology, egyptology, humour and pickled onions. As a keen activist for mental health awareness and having performed a stand-up comedy routine in aid of the ‘Stand Up To Stigma’ campaign, Lynn is in the process of writing a play, the aim of which is to fuse the comedy aspect with the reality behind the laughter. This is in the hope that it helps to reduce the discrimination attached to mental health issues. This will be Lynn’s first book in her poetry series for Wallace Publishing. Whilst continuing to work with verse, Lynn is also busy writing her first novel. Inspired by Lynn’s passion for cemeteries and the delightful residents thereof, this will be a tale of horror, heartache, hilarity, and hopefully a dead good read!